Brother Embroidery Designs From The Personal Perspective Of Two Embroidery Design Enthusiasts. Have you been searching for the perfect home embroidery machine? The machine that would help you in your crafts and handmade gifts for your friends and family. The machine that would make quality children embroidery designs. The machine that you would make use of to monogram your baby's name on her first bib. The machine whose cost would be easy on your purse! 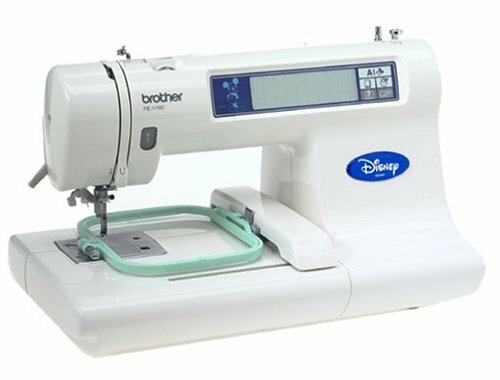 Introducing the Brother PE170D Disney Home Collection Embroidery Machine We know that all of these activities can be done with a big embroidery machine, but the Brother PE170D (weighing just 21.5 pounds) is the right fit for your home needs in terms of size, weight and cost. The key features are the built-in needle threader and quickset drop-in bobbin. The freebies available for you are 87 built-in embroidery designs which includes Mickey Mouse and Friends patterns and 3 alphabet fonts for monogramming. Once ordered, the first thing to do is to view the instructional CD for necessary tips such as bobbin winding and proper framing. It is necessary to buy some good machine thread for this embroidery machine to ensure smooth and flawless embroideries. Amazing Handbook And Guide On Embroidery Machines! Have you ever had problems in deciding the key features to look for when buying an embroidery machine? Is the machine that you are just about to buy the right fit for the kind of work that you intend to do vis-a-vis the cost you are about to pay? What is the best way to set up your sewing area? How do you select the best needles and thread for your embroidery work? 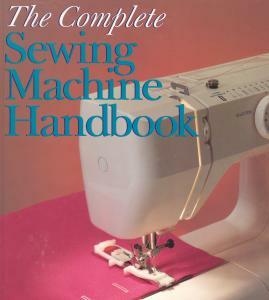 If you are being plagued by the above questions, we have the right book for you which addresses all of the above concerns - The Complete Sewing Machine Handbook by Karen Kunkel . This reveals the secrets of the professional embroidery machines in a simple lucid manner starting with the fundamentals of stitching. It also has a troubleshooting guide with loads of helpful hints and tips. Do let me know if the book helped you? The latest Brother embroidery machine, Innov-is 2500D is available for you in the market. Check the photo! Doesnt it look gorgeous? Closest in performance to the legendary Innov-�s 4000D, the Innov-�s 2500D features dual USB ports for connectivity to your PC, an oversized work area and beautiful, precise stitching. You can manage all your sewing and embroidery functions on the color LCD touch-screen. The generous 6" x 10" embroidery area and built-in editing capability give you the tools to create original and dramatic embroidery design patterns. 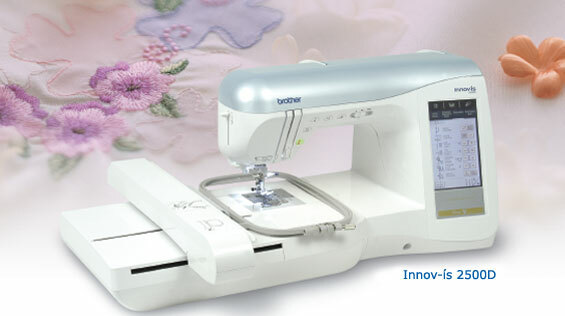 Just like its brothers, the Innov-�s 1000 and Innov-�s 1500D, the Innov-�s 2500D features an advanced needle threading system, automatic upper thread tensioning and dozens of built-in sewing stitches and embroidery patterns. A Treatise On Free Brother Embroidery Designs! 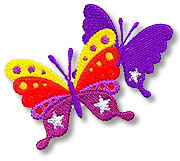 If you want to see the wonders of Brother embroidery designs, you must visit Brother-USA. They have the most wonderful collection and really work as a showcase of brother embroidery machine designs. There are free downloadable embroidery designs which you can work on right away. The designs are bright with clear stitches which portrays a lot of confidence. To share with you the stitch details for the free embroidery design shown next to this post, the width is 90.6mm and the height is 78.2mm. The stitch count is 8641 and the color code is Purple, Yellow, Vermilion, Red, Lilac, Magenta, Purple, White - (614), (205), (030), (800), (612), (620), (614), (001). Have a great time stitching on your brother embroidery machine! Among the best brother embroidery machines that I have come across, one machine seems to have a cut above the rest - the Brother PQ 1500. One among the many great features that we have on the brother embroidery machine is that it can sew up to 1500 stitches per minute, which means that you can embroider much faster than with normal machines. It also has a built-in automatic needle threader which ensures that you dont have to learn to thread your needle: the machine does it for you! A third feature that the Brother embroidery machine has is an automatic underbed thread trimmer, which ensures a smooth look and feel of your embroidery design. Organ needles (which are the latest in the world of needles) come free with a purchase of this machine. In fact some reports came in over the embroidery forums that the Brother embroidery machine scores well over the Pfaff machine.